How Hot Is The Heavyweight Fire? Former Ultimate Fighting Championship (UFC) heavyweight champion, Cain Velasquez, is making his return to mixed martial arts (MMA) after two-and-a-half years on the sidelines. In fact, Velasquez has only competed twice since late 2013. That means we missed five years of his fighting prime and honestly, I’m not sure what to expect moving forward. Even if he wins and looks like the previous version of himself, the one who made a mockery of Junior dos Santos and Travis Browne, just to name a few, how many years do we have left? Velasquez is 36 and prone to injuries and it’s not like you get hurt less as you get older, so I’m not sure if the emotional investment is worth it, for even his most loyal fans. Like a fighter who consistently misses weight, or fails multiple drug tests, Velasquez is going to need a solid stretch of consecutive appearances to prove otherwise. 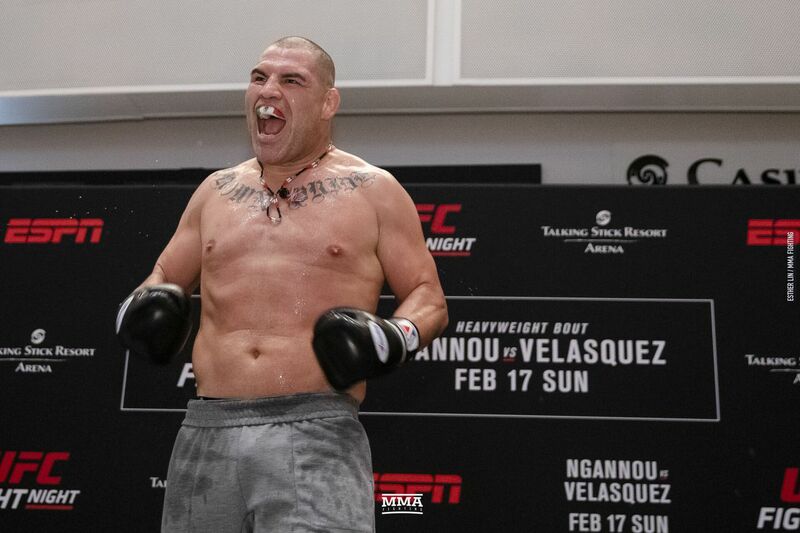 That journey begins in the UFC on ESPN 1 headliner tomorrow night (Sun., Feb. 17, 2019) inside Talking Stick Resort & Casino in Phoenix, Arizona, where Velasquez battles top heavyweight contender, Francis Ngannou. Like his opponent, “The Predator” is also working to negate some of those less-than-flattering headlines over the past few months. When you combine the heavyweight Top 15, it’s 500 years old with an arithmetic mean of 33.5. That doesn’t include the unranked Velasquez at 36 or the soon-to-be 40 year-old Daniel Cormier, who captured the crown from Stipe Miocic, 36, last July. I find it troubling that only two ranked fighters are under the age of 30 and those are Curtis Blaydes and Tai Tuivasa. Ngannou (12-3) sits right in the middle at 32 years old. Velasquez and Cormier, longtime friends and training partners, are never going to fight for the division title. Not that “DC” will be available anytime soon, thanks to proposed title defenses against Brock Lesnar and perhaps even Jon Jones, so regardless of who walks away the winner in Phoenix, they’ll likely need another dance partner to stay active this year. I hear this guy is (still) looking for a fight. It’s safe to say fans were excited with the announcement that Dustin Poirier and Justin Gaethje would square off in the main event on April 14 at UFC on Fox 29. The post Henry Cejudo Flees Fire, Promises He’ll Still Fight at UFC 218 appeared first on Caged Insider. Alistair Overeem had a slightly harrowing experience less than a week from his fight at UFC 213. Last-minute fight cancellations are a nightmare for MMA promoters. Injuries and weight issues are at the top of the list of most common reasons why bouts are cancelled in major promotions these days, but it’s unlikely that anything ever comes close to PRIDE 9’s Matt Serra vs. Johil de Oliveira bout. Oliveira and Serra were both set to make their PRIDE debut that night, June 4, 2000. The Brazilian signed with the Japanese promotion after winning multiple one-night tournaments in Brazil and capturing the IVC championship, while Serra, a 26-year-old talent under Renzo Gracie, was 3-0 in the sport. PRIDE 9 was marking the return of the promotion to Nagoya, and featured the likes of Vitor Belfort, Igor Vovchanchyn, Ricco Rodriguez and Heath Herring. It was far from PRIDE’s most stacked events, especially if you compare it to the openweight tournament that took place months before in Tokyo, but what happened that night at the Nagoya Rainbow Hall was unforgettable. Oliveira was about to walk out to the ring when a huge mistake led to him having most of his body burned. Serra found himself without an opponent that night, and ended up never fighting in PRIDE. “The Terror” scored another win in a small promotion in New York before he started his nine-year run in the UFC, but Oliveira’s road wasn’t as glorious as his. That night in Nagoya, the Brazilian was rushed to a burn center in Nagoya, and stayed there for two months. When he was finally cleared to return to Brazil, Oliveira had a list of things he couldn’t do for a long time, including shaving or sunbathing. As soon as he landed in Rio de Janeiro, Oliveira realized he has made a big mistake. In times where seven-figure pays in MMA were rare, everyone thought Oliveira had at least a million-dollar check in his pocket. Oliveira used part of the money to buy a house, and invested the rest in a gym and other businesses, but his ventures collapsed soon after. “$ 70,000 were good money back then,” Oliveira says, “but that’s way less than what I could’ve made. Many people said that if I had sued PRIDE I’d be rich and wouldn’t need to fight anymore, but I didn’t want to do that because I respected them. The freak accident didn’t stop him from fighting, though, but walking to a ring wasn’t as easy as it once was. It wouldn’t be a smart decision to go back to the ring right away, but Oliveira recalls being advised by his manager and trainers that turning down opportunities to compete in PRIDE could mean the end of his career in Japan. Oliveira would make $ 30,000 per fight with a $ 15,000 win bonus in his PRIDE deal. At PRIDE 12, six months after having 70 percent of his body burned, the Brazilian was facing Carlos Newton, who was on a four-fight winning streak — and had the experience of competing against Dan Henderson and Kazushi Sakuraba before in the UFC and PRIDE, respectively. “There was a fire extinguisher in the hallway. I looked at it and thought ‘let me grab this just in case I’m burned again, so I can put out the fire myself,’” Oliveira says with a laugh. “The Japanese crew said I couldn’t do that, that it wasn’t allowed, but I said I wouldn’t go to the ring if I couldn’t carry that with me, so they let me do it. Between his PRIDE debut and the return against Schembri, though, Oliveira almost lost his eyesight. The IVC champion was injured in a car accident in Brazil, but decided to go on and face the dangerous grappler, who was making his MMA debut. Oliveira’s eye issues continue now. The MMA veteran had to undergo a second transplant in the same eye after being poked in the eye in training, and also needed a cataract surgery. After three surgeries in the left eye, Oliveira recently underwent a right eye cataract surgery as well. Five years have passed since Oliveira’s last MMA bout, but he’s not done fighting. The PRIDE veteran was actually matched up against Jorge Patino “Macaco” in the main event of a small show in Sao Paulo in 2014, but the promoter left the arena when all the fighters realized they wouldn’t be paid for the bouts. At 47, Oliveira is still hungry to compete. In fact, he wouldn’t mind signing with his old “boss”, RIZIN president Nobuyuki Sakakibara, for a return to Japan. “I wouldn’t be skeptical if they gave me a new opportunity,” says Oliveira, who doesn’t feel like Sakakibara took care of him after the accident in PRIDE. “They are signing guys from the old days to compete, so why not give me a fight? I always fought whoever they put in front of me, I was blind in one of the fights. “Fighters hurt their nails and pull out of fights these days. If what I did was right or wrong, I don’t know, but that’s who I am. I think I could have done a lot better in PRIDE if they were more correct with me. I should have had another chance in PRIDE, but they did me wrong. A fight with Matt Serra for his debut in RIZIN, re-booking the PRIDE 9 clash that never happened, doesn’t interest Oliveira because “Serra is way heavier, fat, and he’s not fighting anymore, so I wouldn’t fight him.” Other than that, the Brazilian would face pretty much anyone at 170 pounds. “If your head is fine and you can train, you can fight,” Oliveira says. “I feel fine to fight. If you give me enough time to prepare… I usually get calls on short notice. Shooto (Brazil) called me to fight on a week’s notice (in 2011). People call me to lose, and I ruin their plans. (Shooto) called me to fight ‘Cabelinho’ (Haroldo Bunn), and he was training at the best gym, Nova Uniao, while I was running around the block and only hitting pads three times before the fight, and I won. This is not the way you want to spend your night before a big fight, but at least all the weight cutting was over. According to a report by MMA Junkie, fighters were forced to evacuate the Hilton Canary Wharf hotel in London, England, earlier tonight (Fri., Mar. 17, 2017) due to an apparent fire. With less than 24 hours before UFC Fight Night 107’s start time, fighters were woken out of bed and ushered out of the building as smoke reached as high as the 10th floor. Some of the unexpected action can be seen below courtesy of mixed martial arts (MMA) reporter Simon Head. “As soon as you got into the fire escape, you could smell smoke,” said Ultimate Fighting Championship (UFC) middleweight Scott Askham, who meets Bradley Scott on the UFC Fight Night 107 undercard tomorrow night. “I don’t know what floor, but you could smell smoke coming down the fire exit. Also in attendance was Straight Blast Gym head coach John Kavanagh, who will corner Gunnar Nelson and Makwan Amirkhani on Saturday. Kavanagh was returning from a nearby restaurant to find his hotel out of sorts. This is obviously a hiccup for each and every UFC Fight Night 107 fighter staying at the Hilton Canary Wharf hotel, but at least nobody got seriously hurt. MMAmania.com will deliver LIVE round-by-round, blow-by-blow coverage of the entire UFC Fight Night 107 fight, starting with the UFC Fight Pass “Prelims” matches online, which are scheduled to begin at 1:30 p.m. ET, before the UFC Fight Pass main card start time at 5 p.m. ET.